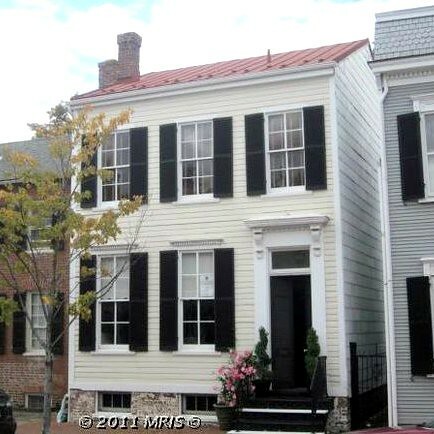 Over the last few weeks the number of amazing historic houses in the Old Town Alexandria real estate market has exploded. You can probably give most of the credit to the nicer weather, and the fact the housing market in our area really hasn't softened all that much. What does that mean for us? It means we get to tour several really astounding houses and share them with you. Last Sunday we were quite excited to see a particular home on the docket of open houses. We knew it was going on the market but were worried we had missed the open house while we were on vacation. But luckily for us, an open house was scheduled for the first weekend we were back. 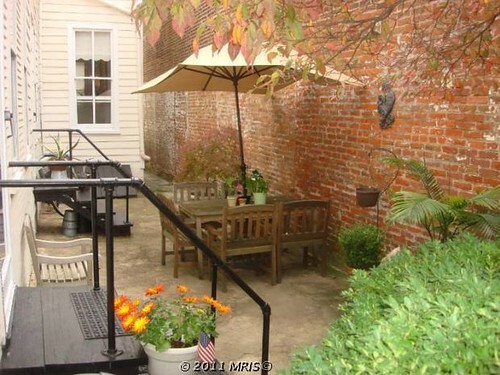 The historic home we toured is a wood frame house located in the 300 block of South Lee Street. I know this may not mean much to you if you don't live around here, but Lee Street is one of those quintessential historic streets in an idyllic historic neighborhood and city. Extending south from Old Town's main street of King Street, and just two blocks form the Potomac River, there are as many as nine city blocks of historic homes that line either side of the street. The ages range from the mid 1700s to the late 1800s, and everything from grand masonry homes with pools and yards to tiny one bedroom wood frame structures built for ship crewman. It is one of the most desirable blocks in a great location. This particular home is situated at 311 South Lee St., just three blocks from King Street and is within a wonderful block of homes. Actually, if you read our Halloween wrapup post, all of the photos of the Halloween crowds centered on this street, and the house we're writing about today is on the left of this photo from that post. As you can see, they are right in the midst of all of the Halloween excitement. That's a MAJOR plus in Wendy's book right there. Beyond location, the house is pretty much exactly what we would be looking for if we were actually home shopping right now (ignoring price). It's age, configuration, four bedrooms, two full baths, and basement are all right in the perfect range for a house you can easily grow old in. 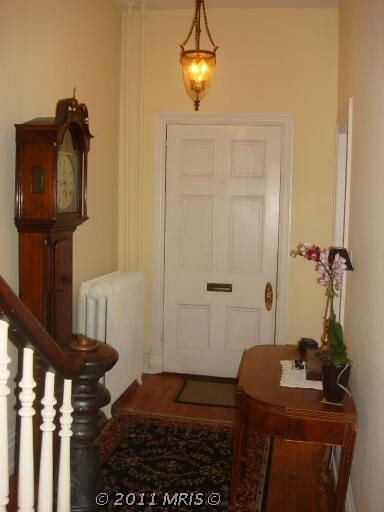 The home retains much of its 19th century character, and has great potential for some renovation. Besides, I'm particularly partial to pre Civil War homes, I just appreciate their scale, history, and style. 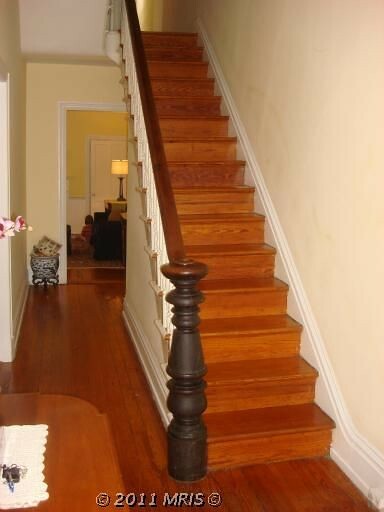 Walking in the front door you are greeted by a beautiful entryway with tall ceilings and staircase with a large newel post and sturdy handrail. The perfect stair for a Christmas garland running the length (I'm looking at you, Wendy). But before heading upstairs, the double parlor to the left with rich wood floors, large windows, and plenty of light are fairly grand and welcoming. 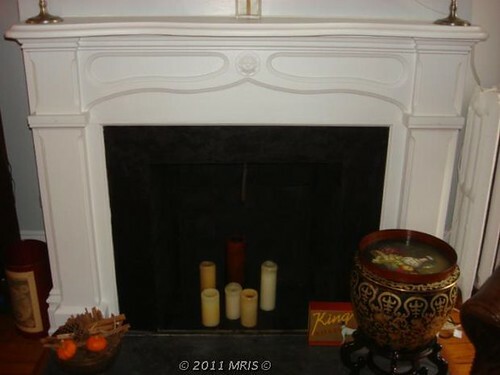 While the fireplaces are not currently functional, as they are the vent for the utilities or were bricked over long ago, they could all be opened, relined, and turned into functional fireboxes. 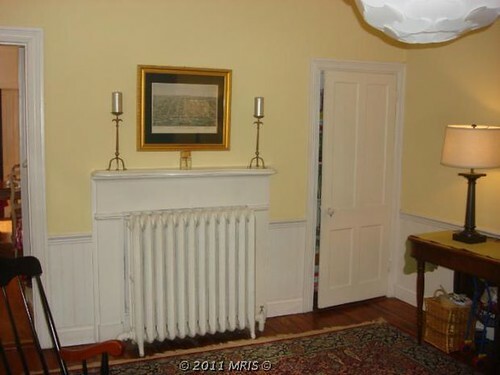 At the very least, they've retained their original mantels and surrounds. The home, though it appears somewhat modest from the street, is actually quite deep. Beyond the first two rooms is a dining room, again with a potential for a fireplace. 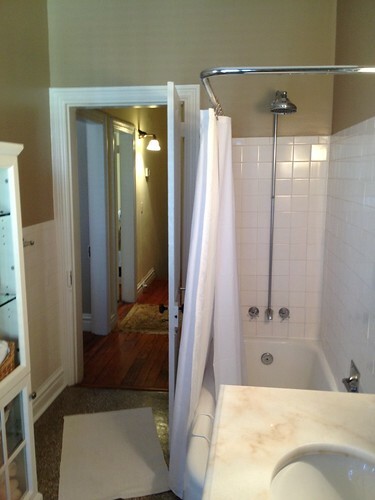 People often tuck powder rooms in the door to the right of the fireplace. And the final two rooms of the house on the first floor are the kitchen, and a small laundy/mud room off the back of the home. 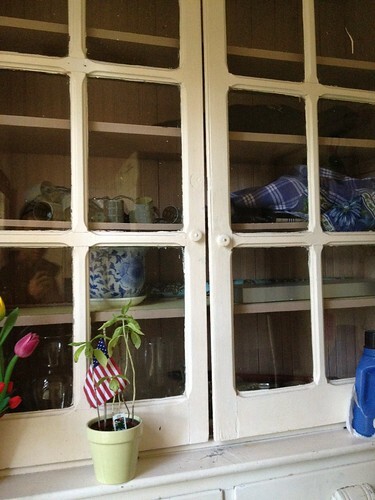 We took this photo of a very cool built in cabinet in the very back room. It was a tight space, so tough to get a good shot, but you can get the idea. One thing that we would LOVE to have in our house, this home actually has. 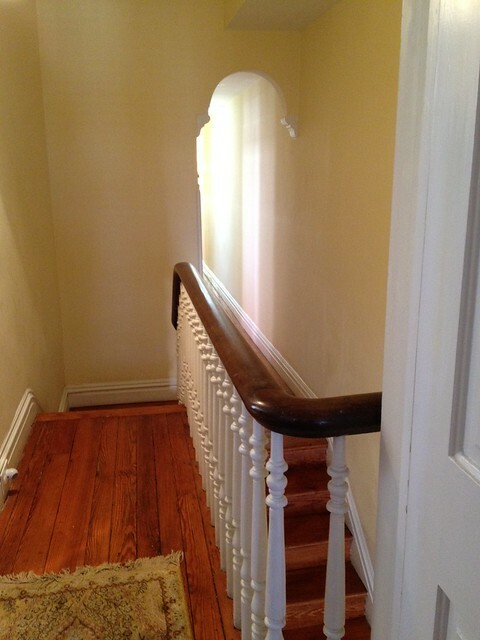 Between the dining room and the kitchen sits a very tight but very cool and interesting back staircase. This back staircase is an interesting feature and a great functional element that provides quick access to the home's back bedrooms and guest bathroom. 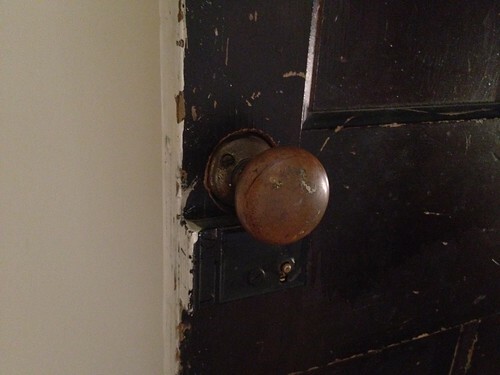 And it is just one of those things that is a perfect example of the charm and character of old homes. 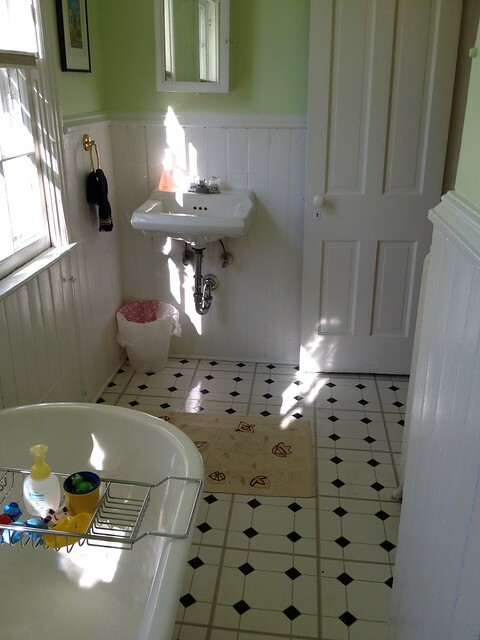 The guest bathroom sits above the mud room and sports a claw foot tub. The floor is linoleum, most likely because it would be nearly impossible to support tile or stone without it cracking due to the floor's deflection. If I were doing this house, I'd probably just stick with the wood floor in the bathroom, and make sure I clean up any water sooner than later. 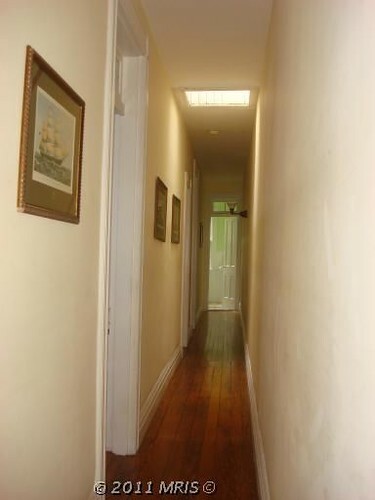 Down a very long hallway, there are two good sized bedrooms on either side of the back stairway. The hallway also has a skylight that appears to have been put in a very long time ago. The beadboard and straight sides hint at its age. The bedrooms both have two nice windows, and small closets. 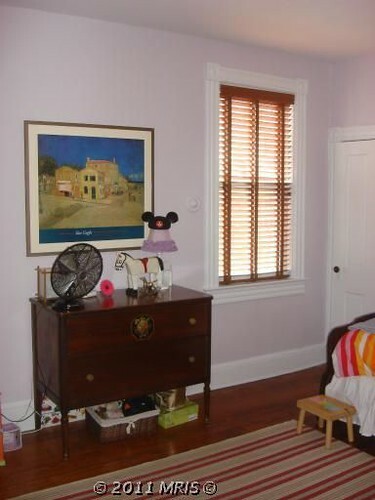 These are really perfect rooms for kids or guests. Towards the front of the house, the hall passes through an interesting arch and the stairs make a little jog and jump up a few more steps. I love this feature in homes around this age. There are currently two bedrooms, and a full bathroom off of the front bedroom. Again, these rooms have fireplaces that are now non-functional, but could work again. 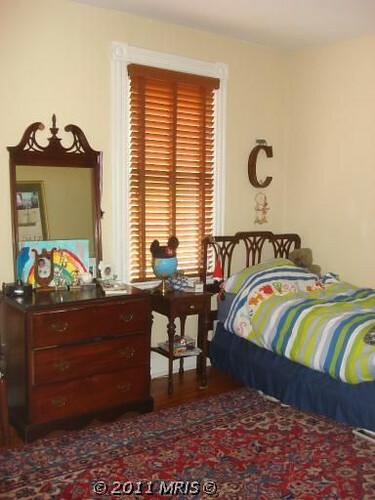 The front bedroom also has an extra window that lets a lot of natural light into the house. 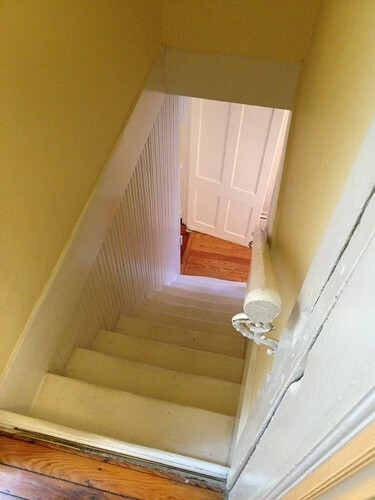 Above the front door and entry way sits a bathroom that opens to the hallway, and to the front bedroom. It is a decent bathroom, just a little bit of an odd configuration. If I were renovating this house, I would actually sacrifice the second bedroom on the front of the house, and turn it into a large master bathroom. 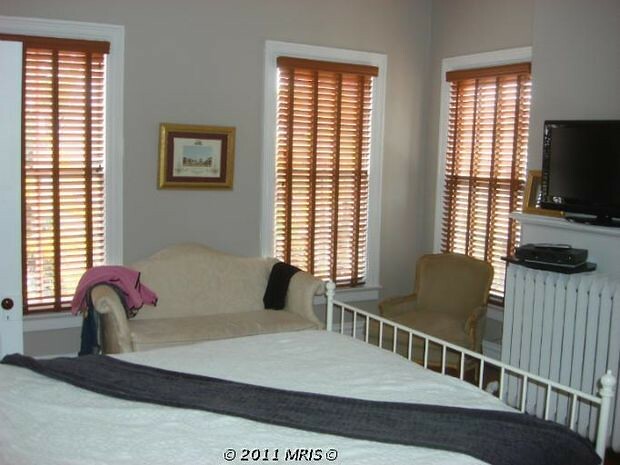 I would then close off the front bathroom and turn it into a large walk-in closet off of the master bedroom. It has a window and is wide enough to be a closet/dressing area. Something that is a major luxury in Old Town. Here's a photo of the second bedroom I'm talking about turning into the master bathroom. 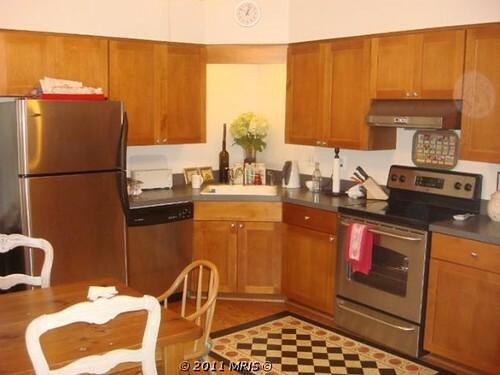 Do you notice, it also has a fireplace. How nice does a bath in a clawfoot tub next to a roaring fire sound to you? And as much as I like stone floors, I think I'd have to leave the heart pine. Wood isn't the best thing for bathrooms, but it is just so warm and inviting. While this home is great on the inside, it also has a nice outdoor area, with actual grass and a good sized entertaining area. And... a parking space! Yes, a parking space in this part of town is about the rarest of amenities. 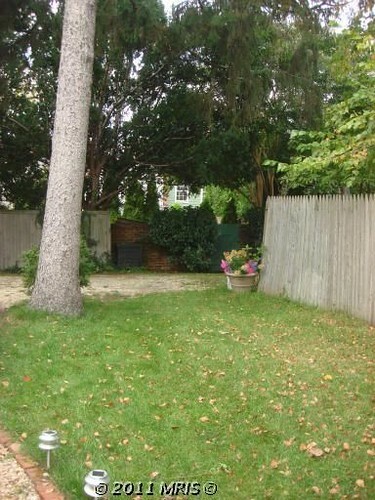 They have plans that would allow you to take down a tree and build a garage, but I don't think I would want to sacrifice the back yard space. I would just park our one car along the back property line, and maybe build a wall or fence back there too. 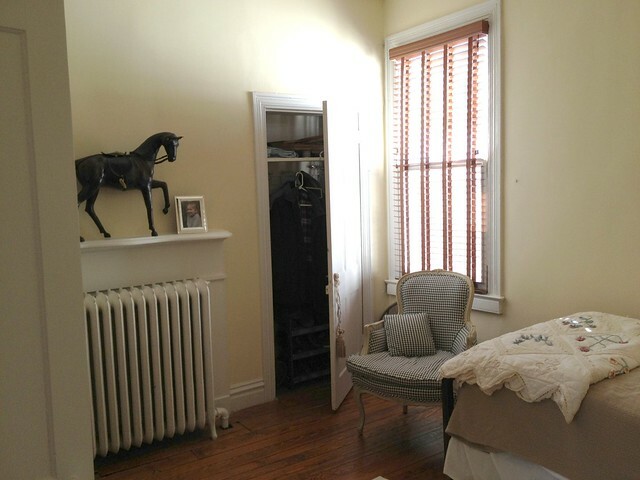 There you have it, a beautiful house in the very desirable part of Old Town with all of the space and conveniences you need in a home today, along with all of the charm, details, and character you'd want in an old home. If you're interested, be sure to check out the listing. We've actually run into the listing agent, Jeffrey McGlothlin, several times over the last few weeks. He's a really nice guy and likes to talk old houses with us. It's open again this weekend, so if you're in the area and are interested, you should stop on by and check it out. Wendy: Yep, absolutely. I'm in love with its Christmas staircase, the location, and the high ceilings. I'd want to do a lot to the kitchen and bathrooms to start, as well as replaster the walls and strip a lot of the original molding. And those ugly ceiling fans would come down on day one. I'd move in a heartbeat if only money were no object. <sigh> I think I'll always look back at this one as "the one that got away." 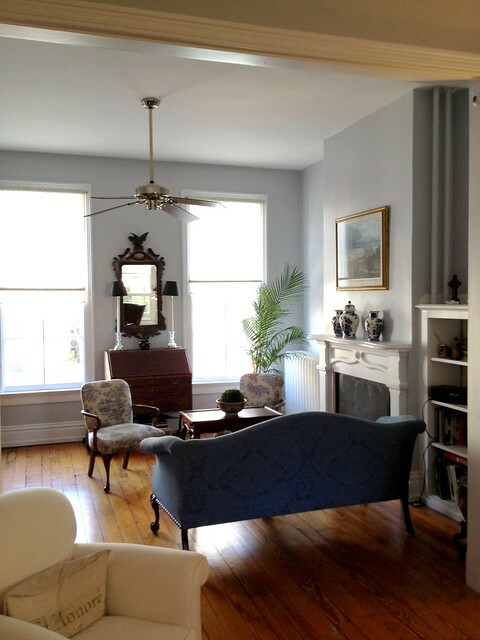 Interested in reading about other interesting homes for sale? Want to offer your take on "would you trade"? 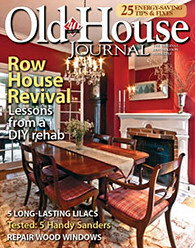 Check out the Open Housing section of Old Town Home. Photo Credits: Listing agent, Jeffrey McGlothlin where "2011 MRIS" is noted. You'd trade your house for a 1.3 million dollar home? Shocking! Shocking, I know ;-) Though, there are places we've gone through that are north of $1.5 million that we couldn't possibly see trading our current home for. But don't forget, we ignore the money factor in this game, sort of an even playing field. :-) You might actually be surprised. We wouldn't trade for all $1.3 million dollar homes in the area. It's more about the house than the price tag. Ahem, those comments were left independently of one another. Are we a good match or what? I like your place better though I can imagine that if you guys got your hands on this place you could knock it out of the park. It will be interesting to see if it sells for the full price. 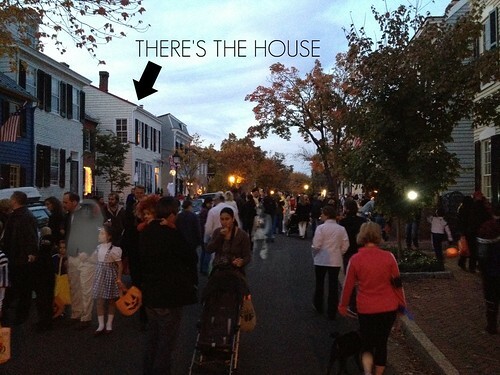 Nice job adding the ghosts into the Halloween photo! You totally had me fooled until I checked the original post and she's not there. Did nobody else see her? Wait a minute, now I recognize Emperor Palpatine...right? I've been waiting for months for someone to notice that! Thank you for picking it out. :-) Actually it's just Halloween clip art from Picnik in Flickr, but you're right, it does look like Palpatine. Good eye picking up on the ghoulish presence. It's funny that you commented on this post today. The house we were talking about just finally sold, and we know the new owners (parents of friends). We'll have to keep our eyes on this home as they make changes to it.